From the brilliant mind of talented developer David L. Hoyt comes Word Roundup Stampede. It’s a word puzzle game with a few Wild West themed tweaks that make it a must-have for word puzzle game enthusiasts. Hoyt’s word puzzle games are not only best selling apps but are also found in over 650 newspapers across the globe. He is in fact, the most syndicated word puzzle game creator in the world. We’ve got to wonder what his mind must be like; does he see everything in a jumble that he strings together with lines? Who knows, but what we do know is that he is the master of the word puzzle game Word Roundup Stampede. 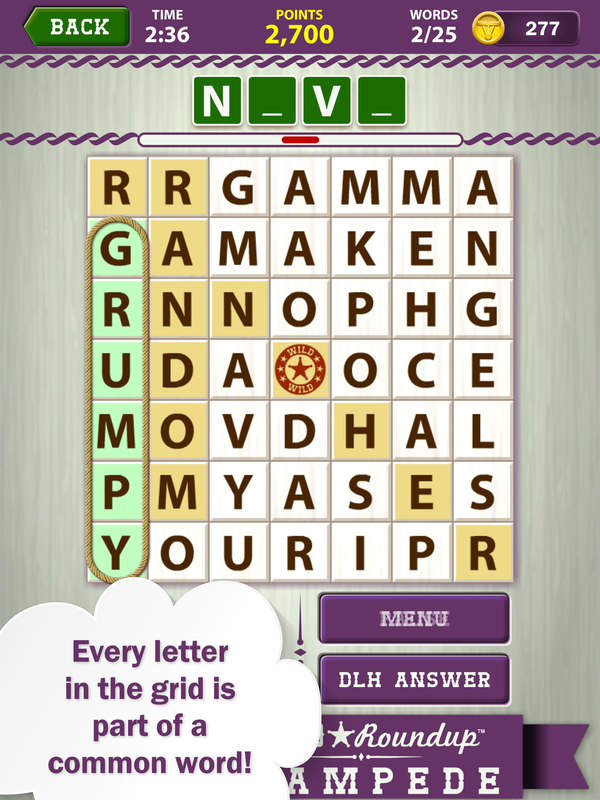 It’s not your average word puzzle game. You’ve got think how much can really change within a word puzzle. There’s a timer and an objective to find as many words as possible within a series of aggressively jumbled letters. However, Hoyt’s creation takes the best of a lot of what makes word puzzles great like the timer and the general format and adds his own unique twist to the genre. Word Roundup Stampede starts with your standard 49 squares puzzle game with columns of 7’s up and down. However, there are a couple of really unique twists that make this game great. There’s a Sheriff’s badge square in the middle for a start, this is used a WILD card, and essentially can be any letter in the alphabet that works with the words you’re trying to create. While that’s one of the more idiosyncratic aspects of the game, the most unique must be the fact that you don’t have a standard word list to work with, like you have in so many other word puzzle games. This is all on you; you’ve got to put the words together based on what you can see and in this game every single letter on the board forms a word, so it’s really not that easy. Don’t despair if it sounds too difficult though; Hoyt has thrown in Hoyt Hints, which gives you a Jeopardy-style word board at the top of the screen where it’s your job to fill in the blanks based on the letters you can see. This is really useful, and as a bonus you’re rewarded with more points and coins whilst using it as you go. These points and coins are used to unlock more puzzles, of which there are 200 total, not counting the unique Daily Challenges, which are of course added daily. Overall it’s a great twist on the word puzzle classics and we love the Wild West theme, which adds another element of fun to the game play as you go. If you’re a fan of Hoyt games you’ll love this. If you’re a fan of challenging word puzzle games you’ll love this. If you’ve never actually tried a word puzzle game before, you’ll still probably love this too. It’s free to download across iOS, Android & Amazon devices and one of our favorite aspects about the game in general is taking on friends and family in multiplayer mode – and absolutely crushing them with our superior vocabulary.